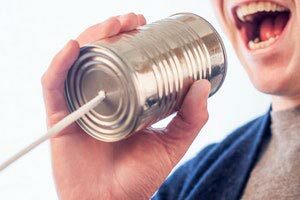 Voice translation is a fairly new and somewhat unproven technology that combines voice recognition software, machine translation, and text-to-speech technology into a new service that (in theory) instantly translates a person's speech from one language into another. How Does a Voice Translator Work? A person speaks into a device (e.g., a smartphone) which then converts their speech into text. The device then uses machine translation software to translate the text from its source language (e.g., English) into a selected target language (e.g., Spanish). Finally, the devices uses text-to-speech software to speak the translated text aloud, allowing the listener to comprehend the original message in their native language. The problem with this technology, like so many other linguistic technologies, is twofold. The first issue is that much of language is intuitive. Since spoken and written languages are not planned and designed like a computer programming language, there are no actual "rules" per se—any rules that exist are really more along the lines of recorded observations by linguists and other experts who have studied other people speaking naturally, using only their intuition to communicate. This also means there are a lot of exceptions to those "rules," which is something that computers—highly logical systems—aren't capable of parsing very well (yet). As usual, the solution is to use the power of humans to overcome the weaknesses of technology! If you're in need of translation for voice for any purpose, Translation Services USA can help. Our team of expert transcribers, professional human translators, and voice over artists can communicate your message in nearly any spoken language! Whatever your needs, contact us today for a free estimate for your voice translation project and we'll be back in touch with you to answer any questions as soon as possible!